Happy Friday! It has been a c-r-a-z-y day. It’s progress report day at school and for some reason that brings about a world of chaos for me. It’s not just the actual 3 days of assessments, but the snagging the kids that are absent, getting those assessments on 1 neat form that is supposed to communicate to parents how the first 4.5 weeks have gone. Of course, every Kindergarten teacher wants to send a glowing report but unfortunately with the standards we have, if 5 year olds are not yet reading 3 letter words, well, they should be very very soon. Never mind that half my class is not speaking the language in which they are learning to read. By the end of the day, I just wanted to gather all my bright and beautiful babies and go play guitar outside in the shade and sing and be happy. My group this year is exceptional in that they all love each other even if there are some scrapping incidents. Knock on a wooden picnic table that it lasts all year. Oh, and I don’t play guitar, but if I did, those reports would have waited until Monday and we would have had a ball outside finding cloud shapes and talking about bugs. I did, however, plan a popcorn party. Nothing says “You are brilliant exceptional children and I’m so glad I’m your teacher!” like cheesy popcorn and a juice pouch. (I know we adults can think of many better rewards, but to my kids, popcorn is next to Pizza on the heiarchy of greatness). 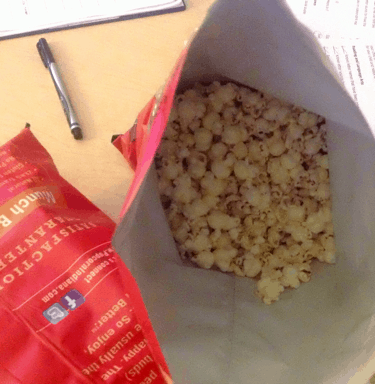 I even got the really good popcorn that I can eat just in case there was some leftover. 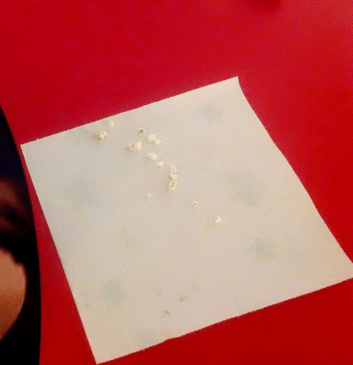 I passed out their popcorn.